We are solving series of problems of on the topic called mechanical properties of solids. Solid material has molecules attached very close to each other and they have strong force of attraction among them. When some external force is applied on the body, its molecules are disturbed and distance between them increases and hence body looses its shape temporarily. When the applied force is withdrawn, internal potential energy pulls the molecules back to the original position and hence body will all most recover its original shape. This property is called elasticity and it is the property of the given solid material and it depends on the nature of the material. 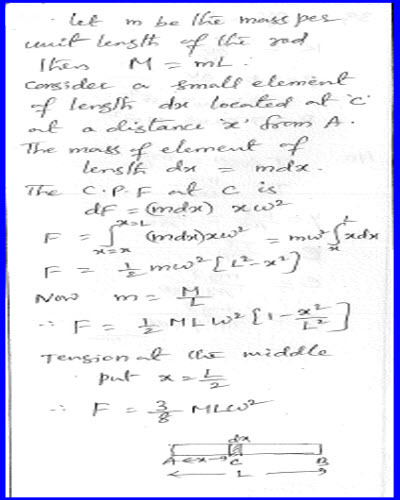 Elastic property of the material is studied with a physical quantity called modulus of elasticity. A rubber cord of catapult has a known cross section and length. 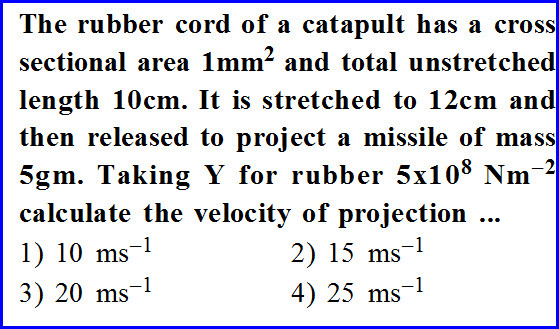 It is stretched by a length 12 centimeter and a stone of mass 5 gram is released from it.If young's modulus of the rubber is given to us as shown in the diagram below, we need to measure the velocity with which the stone is released from the catapult ? We know that when rubber is pulled from its original position, we have used some of our energy and that is stored in the rubber in the form of elastic potential energy. All this energy is given to the stone and it gets kinetic energy. So we can use law of conservation of energy and solve the problem as shown in the diagram below. 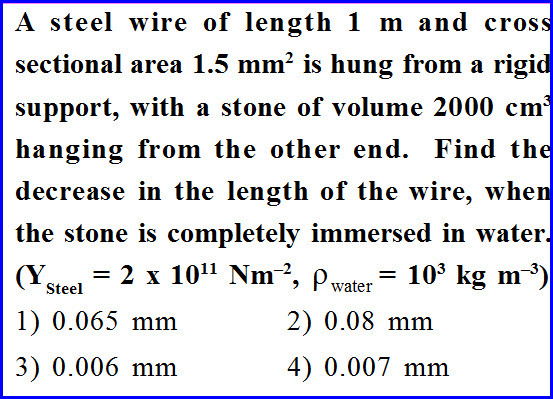 A steel wire of length one meter and known area of cross section is hung from a rigid support with a stone of volume 2000 centimeter square hanging from the other end. We need to measure the decrease in the elongation of the wire when the body is immersed in the water. When the wire is under the load of the sphere the force acting on the wire is nothing but weight of the wire. When that load is immersed in the water, there is a new force called upthrust and hence the resultant force acting on the wire decreases. It is the difference between the weight and the upthrust. As a result the expansion of the wire also decreases. A metal wire of length and area of cross section known is available. If the wire breaks due to a applied load, we need to know the rise in the temperature of the system and the problem is as shown in the diagram below. 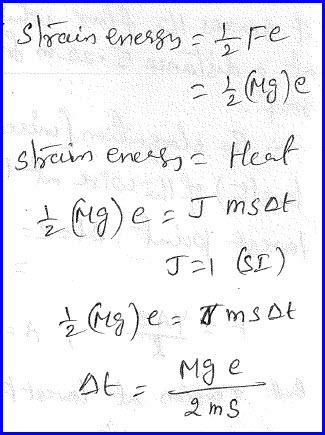 To solve this problem, we need to equate the strain energy to the heat energy generated in the system. Heat energy is in the form of specific heat and it is from that definition itself. By equating them, the problem is solved as shown in the diagram below. 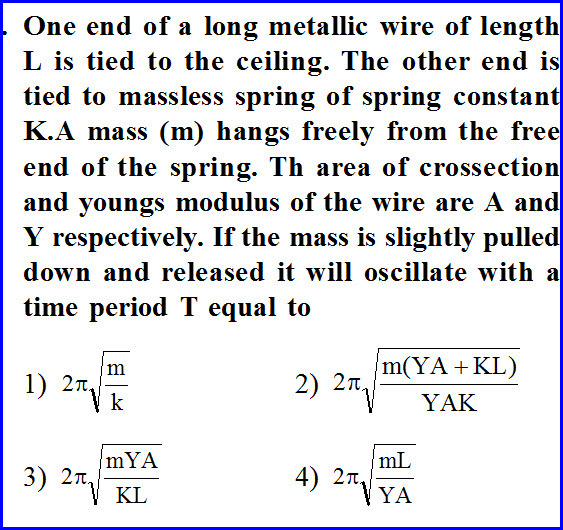 One end of a long metallic wire of known length is tied to a ceiling and the other end is tied to a mass less spring of known spring constant. If the attached load is slightly pulled down down and released it will oscillate with a time period and we need to find that time period and the problem is as shown in the diagram below. 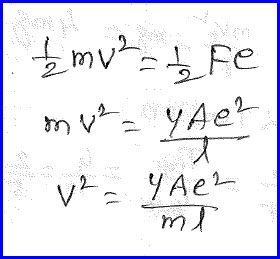 The wire also behaves like a spring and we can find the spring constant equivalent of the wire and we can find it using the definition of Young's modulus. 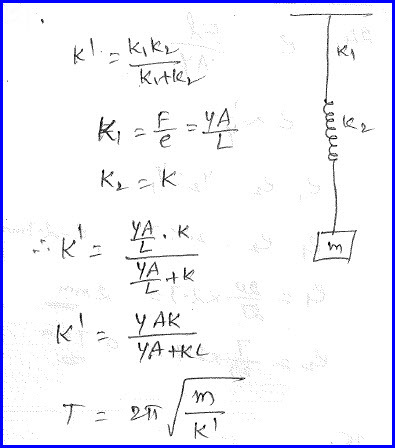 The other spring and this are in series and we can find the effective spring constant of the system as shown in the diagram below. We can also write the equation for the time period as shown in the diagram below. 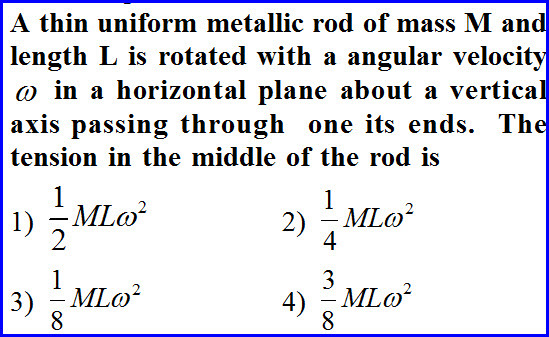 A thin uniform metallic rod of mass M and length L is rotated with a angular velocity in a horizontal plane about a vertical axis passing through one of its ends. The tension in the middle of the rod has to be found and the problem is as shown in the diagram below. 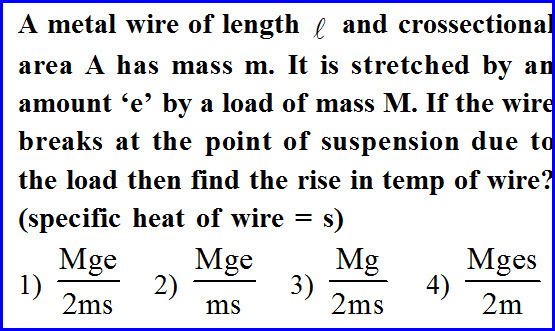 Let mass per unit length m, so that we can find the total mass of the wire as shown in the diagram below. We can find the centripetal force at any given instant using its definition. 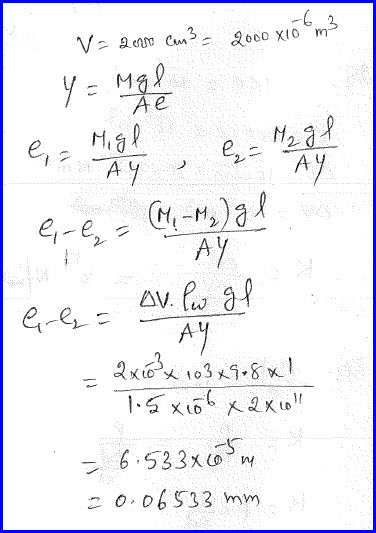 To find the total value, we shall integrate the equation as shown in the diagram below.